A concert is never complete without these folks. They don’t need to tell you how much of a fan they are—you can easily tell by their shirts and official merch. These fans tend to tear up in the middle of their singing, dancing, screaming, and cheering. Who can blame them? It’s not every day you get to see your idols up close and performing live. When the lights go down and the band takes the stage, up goes their phones. They want to document everything to relive the moment and share the memories with other people. Sometimes, concerts gift us with celebrities found among the audience—your favorite local artists know how to have a good time, too. If you’re lucky enough to score VIP seats, there's a good chance you’ll be jamming with celebs as well. We have so much respect for the parents who accompany their tweens to concerts. It’s a true sign of parental dedication. They’re the real MVPs. They are there to chill and enjoy the music. They’re a little bit of everything: they take pictures, head bob, and mouth the lyrics in low-key fashion. These people know how to immerse themselves in the moment. They know all the lyrics and will sing along from start to finish. And if the performer happens to play dance tunes, they can pull off the official dance choreography, too. These people are having a blast, and as long as they’re not harming anyone, that’s all that matters. So which one are you? Channel your concert personality or see if you can spot these types at the Philippine leg of Ed Sheeran’s Divide Tour, happening on November 7 at the SM Mall of Asia Concert Grounds. 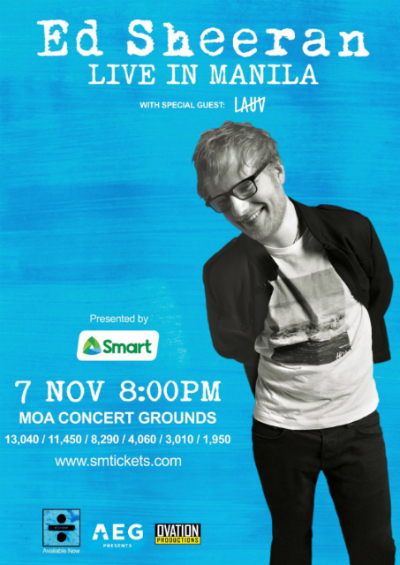 Smart Music is giving fans a chance to win free tickets to the Ed Sheeran concert and other upcoming events—and there are more concerts coming our way. Admission isn't the only thing Smart has in store for their subscribers, either. The full concert experience awaits fans, including a meet and greet, on-ground activities (like a party bus! ), and exclusive merch. To score free tickets and prizes, track the #SmartMusicLive hashtag and follow Smart’s Facebook, Instagram, and Twitter accounts. Visit smart.com.ph for more details. This article was created by Summit Storylabs in partnership with Smart Communications.